Should We Crown Valentino Rossi So Soon? Honda’s Valentino Rossi has had a perfect start to his second season aboard a 500 GP bike – winning all three races, thus far. The world motorcycle press has gushed over Rossi’s talent, and apparent destiny as the dominant rider in the 500 GP class. There is plenty of evidence that Rossi deserves the accolades given him by the press. 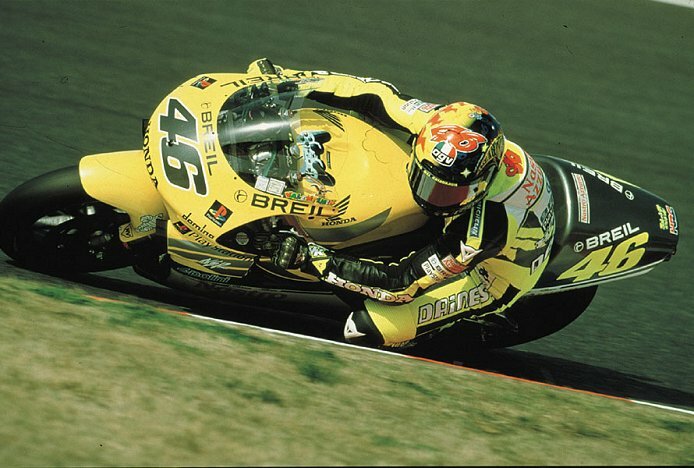 He has won World Championships in the 125 and 250 classes, and is repeating his pattern of learning the class the first year and dominating it the second. Honda advisor Mick Doohan, quite possibly the greatest 500 GP racer in history, has declared his own admiration for Rossi. Despite his Honda bias, Doohan’s words are very meaningful, because he is not quick to praise riders in the 500 class, mainly because none of them have seemed to live up to Doohan’s own standards until Rossi arrived. In addition to Rossi’s amazing talent as a rider, his loose and comical style off the bike have made him a favorite of fans and the media. Rossi is indeed a very special talent, and he is winning consistently against a class that is composed of many other gifted riders, such as Max Biaggi, Gary McCoy, defending champion Kenny Roberts, and others. Nevertheless, Rossi is just getting started and must continue to prove himself in the top tier of motorcycle racing before we can conclude he is likely to dominate the class for the next several years (as some journalists have already concluded). In racing, of course, luck must often go hand in hand with skill, and Rossi has a long road ahead of him to step into the club composed of Doohan, Wayne Rainey, Kevin Schwantz, Eddie Lawson, and Kenny Roberts Sr.